Oliver Sacks. Random House, New York, 1998. It is difficult to know how to describe this marvelous book. It is really two books, both about intellectual explorations of the South Pacific islands of Micronesia. 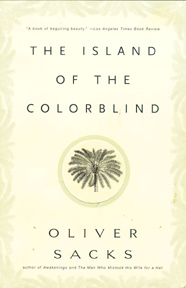 Written by a neurologist (Sacks also wrote Awakenings) with very broad interests in biology, it first tells the story of a visit to a tiny Pacific atoll in search of the answer to a medical riddle, and then recounts another trip to Micronesia, this time to the island of Guam in search of cycaids. Part travelogue, part medical mystery story, part botanical investigation, this beautifully written account is a delightful voyage of discovery that immerses the reader in island life, the wonders of cycaids, and the mysteries of the human mind.